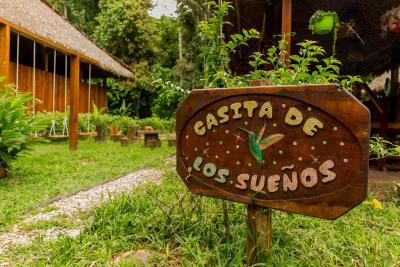 Lock in a great price for Posada Amazonas Lodge – rated 8.9 by recent guests! 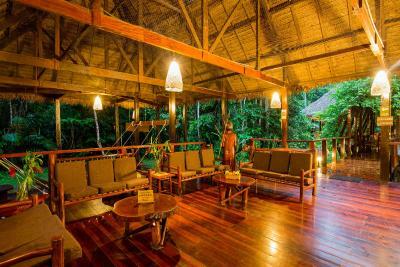 We had a fantastic three night excursion to the rainforest. The facilities were clean and maintained. Staff were extremely helpful- this is a very well organized operation! 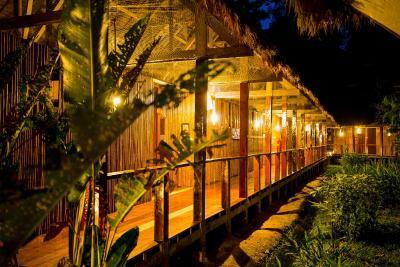 The rooms are open to the elements on one side, but staff lower the mosquito netting while guests are at dinner. Early to bed is the key because activities start very early in the day (4:30 am) to beat the heat in the afternoon. Our biggest compliment is to the staff- our guide, Gilbert, was knowledgeable, patient, organized and obviously loved his work. He is a remarkable man. This is a very unique hotel, with rooms open to nature and fantastic staff. 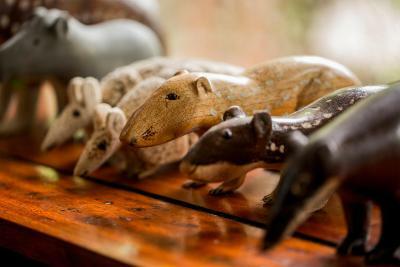 While there were a few large tours staying at the hotel, we were provided with a private guide and were generally able to avoid the large group activities. The food was very good as well. This lodge is amazing. We are just back from staying here - sadly for only 2.5 days - and had an amazing time. The activities are planned throughout the day with rest breaks in between. The meals are delish and the rooms are wonderful. We went on several different hiking trucks saw six species of monkeys, many many types of Macaws and parrots, Cayman, and river otters. We also didn’t see a single snake - which I was worried about ;,). We can only hope we’ll be lucky enough to visit again one day - thanks Cesar!!! 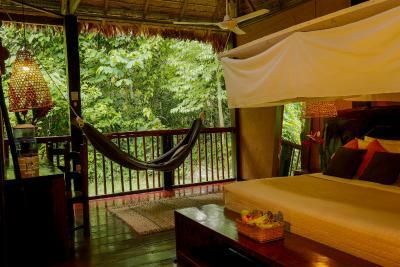 A very comfortable way to experience the rainforest. Staff were lovely and good food. Canopy views were excellent. 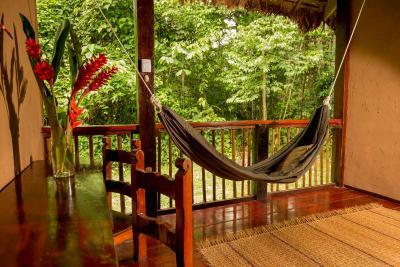 I was looking forward to a relaxing couple of days swinging in my hammock, reading a book, and listening to the sounds of the jungle. That is NOT what is on offer here. Sure, you can opt out of the guided tours, but you'd be missing SO MUCH. You are assigned a guide and a group, and you do everything together; explore the jungle, fish for piranha (catch and release, natch), even break bread together. Our guide, Luis M., was knowledgeable and accommodating. The staff of the resort were friendly and helpful. The activities director even walked me back to my room with an umbrella in one of the hugest lightening storms I have ever encountered. The food was plentiful and good. Just getting there and back was an adventure. An amazing experience. Bring bug spray, good shoes/boots, a decent flashlight and a flexible attitude, and you'll have a wonderful time. Location. Friendly and helpful staff and knowledgable guides. The tours were excellent. The terrain sometimes a bit of a struggle. Food and drink were always available. 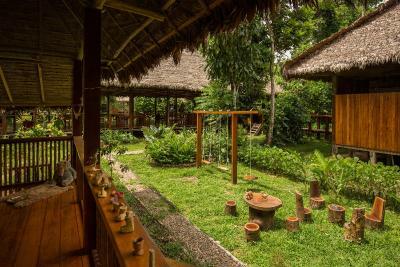 The staff and attention to sustainable and responsible tourism is what makes this place extra special. The guides are professional, personable and very knowledges- they work with the likes of the BBC and nature professionals and it was a privilege to learn about the rainforest with them! Good range of food. Guide was very passionate. Lovely staff. Made me soup when I wasn’t feeling great. 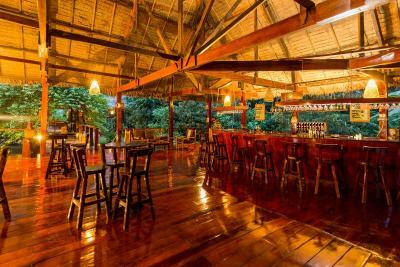 Great setting in the Amazon. A worthwhile experience. 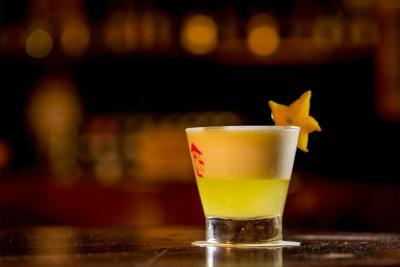 Excellent pisco sours. 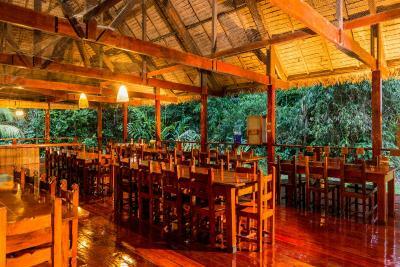 One of our top picks in Puerto Maldonado.Featuring a restaurant, Posada Amazonas Lodge is located in Puerto Maldonado. Free WiFi access is available in the superior rooms. 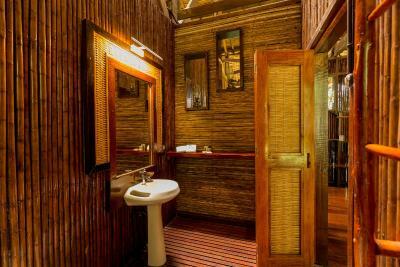 Each room here features a mosquito net and a private bathroom with free toiletries. Superior rooms have electricity between 12:00 and 13:00 and between 17:00 and 21:00. Other rooms are lit by candle light. 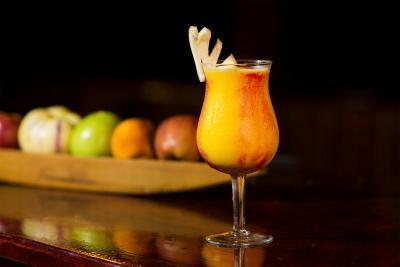 A daily breakfast, lunch and dinner are included. 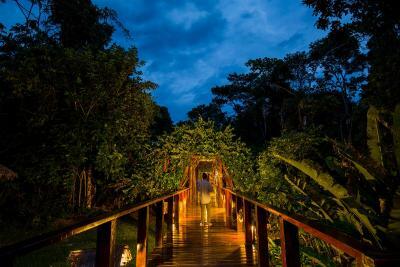 At Posada Amazonas Lodge guests will find an airport shuttle, a 24-hour front desk and a garden. Other facilities offered at the property include a tour desk and luggage storage. 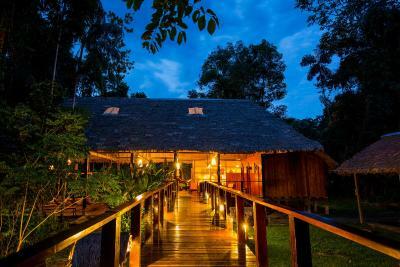 When would you like to stay at Posada Amazonas Lodge? 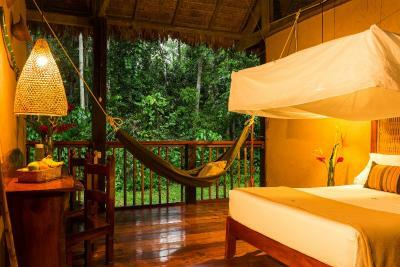 This twin room features a mosquito net and a private bathroom. Electricity is available from 12:00 to 13:00 and from 17:00 to 21:30. 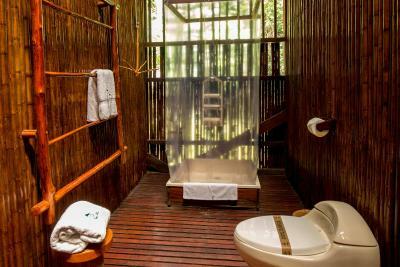 This twin room features a mosquito net and a private bathroom. The room is lit by candle light. An extra bed can be requested at a surcharge. 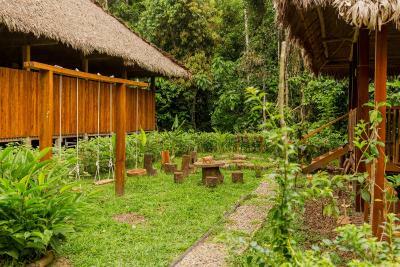 House Rules Posada Amazonas Lodge takes special requests – add in the next step! One child under 6 years is charged USD 222 per night when using existing beds. All children under 2 years are charged USD 222 per night in a crib. All children under 6 years are charged USD 222 per night for extra beds. 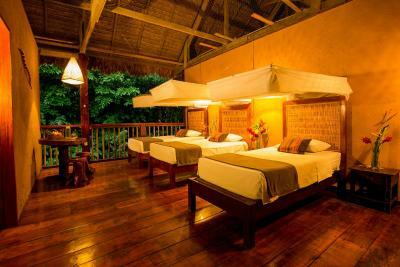 Any additional older children or adults are charged USD 300 per night for extra beds. 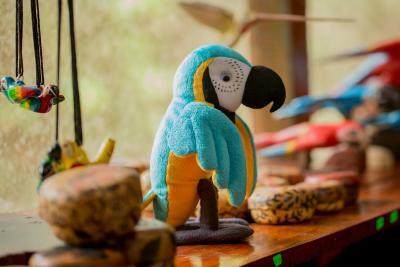 Cash Posada Amazonas Lodge accepts these cards and reserves the right to temporarily hold an amount prior to arrival. 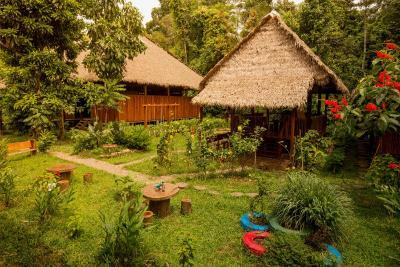 Posada Amazonas Lodge accepts these cards and reserves the right to temporarily hold an amount prior to arrival. 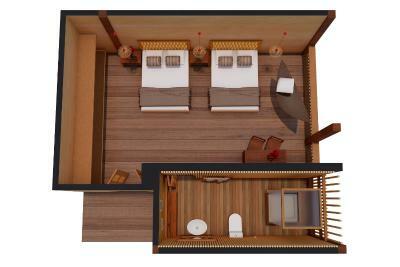 Please note an extra bed can be only be requested for the Traditional Twin Room. Extra beds are not available for other room types. Services after these hours can be arranged for an extra fee. 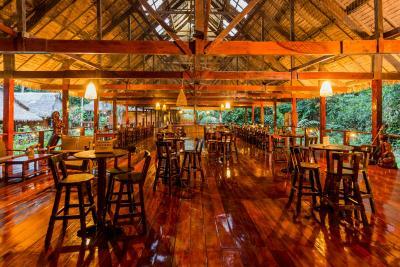 Please inform Posada Amazonas Lodge of your expected arrival time in advance. You can use the Special Requests box when booking, or contact the property directly using the contact details in your confirmation. It was a good introduction to the rainforest but perhaps a little bland for someone who has done it before. Poorly organized. You get dropped off at their office early in the morning even though your flight is at 5pm. So you hang around their office all day. If you ask for a snack while you are waiting they refer you to the bar to purchase something. 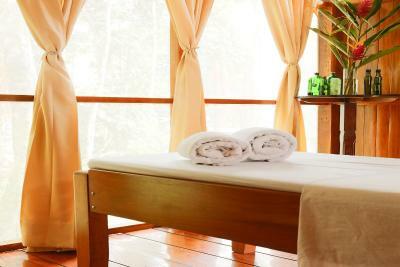 For a lodge in that price range I would expect much better service and more professional staff. Our guide was great however! 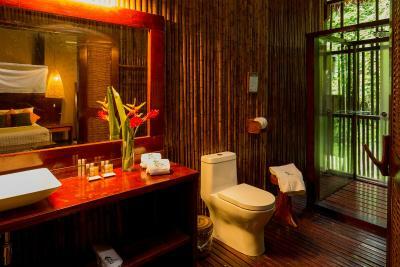 Be aware that although you have your own room with private bathroom, hot shower, etc, there is very little actual privacy. The wall facing the jungle isn't there. There is no wall, just a railing. Also, the walls separating the rooms don't go all the way to the roof. You can't see through them, but you can hear everything going on in the next room, and they can hear you. It was never an issue for us, but might be for some. I've never been "glamping", but this is somewhat like it, I think. 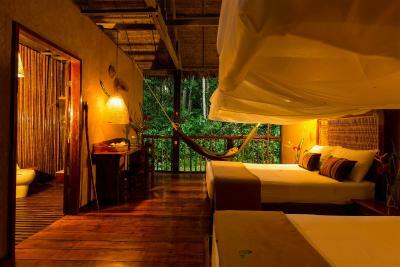 The Posada Amazonas is a high end lodge in the middle of the forest. 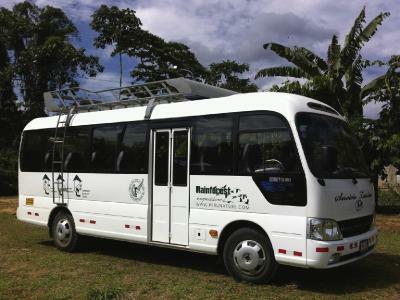 Included in the amount we paid was transportation from the airport, accommodation, good food and a guide that organized activities all day in the forest. It was an epic experience. The rooms had no wall facing the forest; allowing insects and other critters access to the room. An electric overhead fan in the rooms would have been nice. 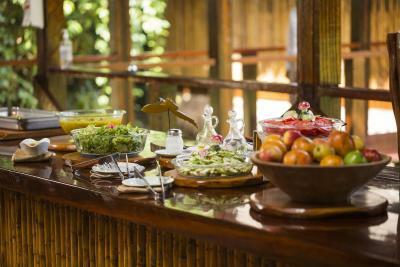 The food, although plentiful, did not, in my opinion, represent Amazonian food. 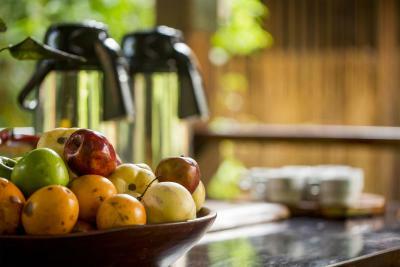 Our guides and staff may have had access to Amazonian food, but these were not offered to the guests. Just be warned that you are staying out in the elements of the jungle. While you are provided with mosquito nets, the place is very buggy and hot. 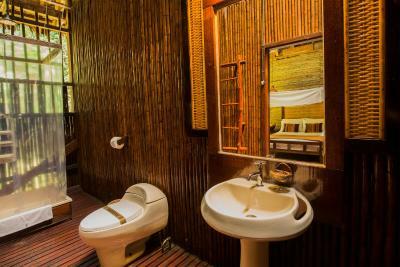 Also, due to the open nature of the rooms, there is very little sound privacy. The mosquito nets, although much much needed also blocks out cool air coming in so it can get very hot under the mosquito net all night..this is no fault of the lodge but perhaps an electric fan could run at certain times of the day if the generator allowed it? We liked it all but if you're used to luxury, 24 hours electricity, spotless rooms with no bugs etc.. then this place might not be your cup of tea. Plus steps up to property (10mins) might be difficult for those with mobility issues. 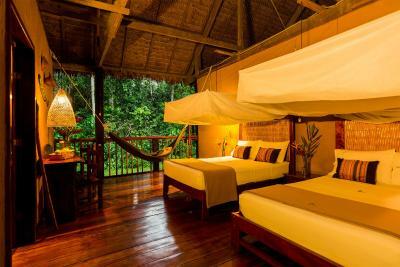 We enjoyed our stay, being in the Amazon is an amazing experience. 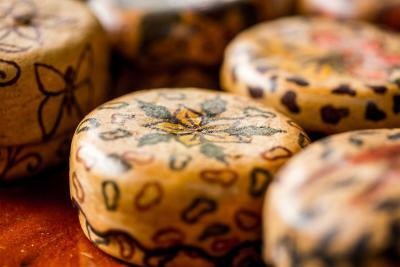 The staff were very friendly and helpful and our guide was knowledgeable. 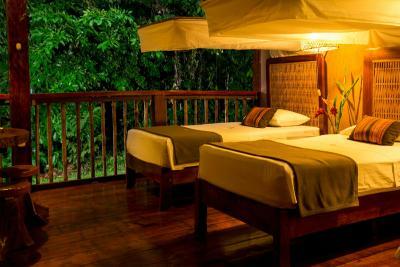 The room was perfectly clean with turn down service, obviously expect bugs in the room/ bathroom - this is the rainforest after all. As it is humid your belongings/ provided towels/ bedding will be a little moist but it's all part of the parcel for where you are! 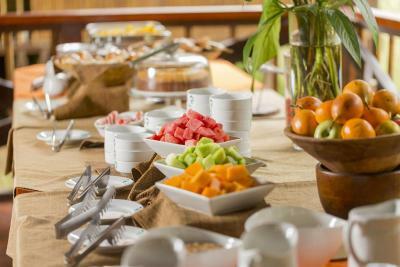 The food was amazing, buffet style, lots of choice and catered very well for dietary needs. You weren't left hungry. Also given refreshments when returning from activities. 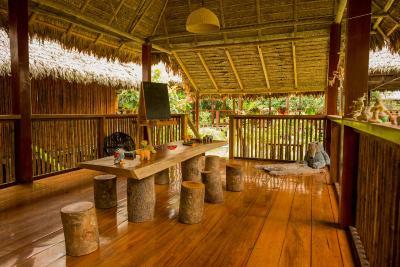 The lodge is well maintained, lots of areas to relax in. We went in wet season which was great as there were only about 10 of us in whole of lodge (instead of the possible 80/90 capacity) and it didn't rain in the day either so got best of both worlds. We saw Amazonian wildlife (macaws, capibaras, a few monkeys and lots of insects - maybe not as much as I'd envisaged but that's nature for you! Early starts, needed more relaxing time. There’s a masseuse but no time for a massage.